Our Mesa auto mechanics have the education, training and know-how that is needed to fix your car! Mesa is the third largest city in Arizona. By being also close to Phoenix, it is home to many commuters and their families that enjoy the climate, the desert landscape and the way of living. Mesa, like most cities in the Valley of the Sun is superbly connected thanks to the great infrastructure which has been growing for several decades with no end in sight. To get from point A to point B anywhere in Mesa you will need a car. The heat as well as the large distances make transportation with anything but a car hot and cumbersome. But what do you do it your car or truck is stuck? Maybe there is a suspicious leak under your car in the morning, when you leave for work, or maybe there is a noise, which wasn’t there last week? Regardless of what the issue may be, you will need an expert Mesa car mechanic you can detect the issue and fix it for you. Scottsdale Muffler and Automotive is that expert! 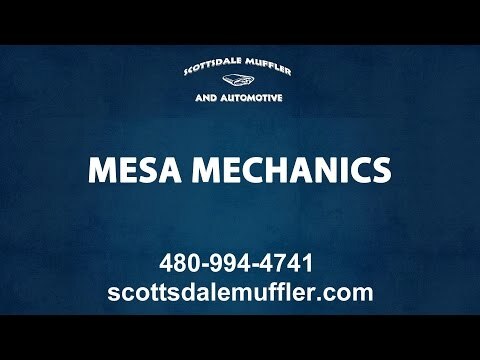 Our Mesa auto mechanics have the education, training and know-how that is needed to fix your car. Additionally, we encourage them to stay on top of current developments in the car manufacturing process, to better serve our clients. The automotive manufacturing process is changing rapidly and Scottsdale Muffler and Automotive is proud to stay on top of recent innovations in design and the repair process. Despite our unique name, our Scottsdale car mechanics can tackle any automotive challenge that crosses their path! Scottsdale Muffler and Automotive performs car and truck repair services on a small or large scale. If you need an oil change, the tires aligned, a coolant flush or any other type of smallish repair service, our general Mesa car mechanics are able to help. Should your truck need an engine repaired or rebuilt, brakes repaired, or an expert tune-up, we can do that too. Any car, any size, domestic or import, we have the experience, tools and education to get your vehicle back in shape and back on the road. Driving around Mesa in a car that has problems or is in need of repair can be dangerous to you and those you share the road with. If you discover a leak or suddenly hear an odd noise that wasn’t there before, get your truck or car checked by Scottsdale Muffler and Automotive as soon as possible. We have the equipment to figure out the reason for that check engine light, replace brake pads or disks, or perform any other Scottsdale Auto Maintenance that will restore your car to its original safe and healthy state. Scottsdale Muffler and Automotive knows cars. From a dented bumper to a failing engine, we got you (and your car) covered. With continued training, awareness of new repair techniques and honest customer service we have grown to a repair shop that gets most of its clients through referrals from previous customers. And we are really proud of that. There is no better testimony to the quality of work our Mesa mechanics perform than positive referrals. Regardless if you are a new client or a repeat customer, we are looking forward to providing your car with the repair experience it deserves. Contact us today to learn more about the services we offer, including our specialty services. You can reach our office at 480-994-4741. Our expert Arizona mechanics and their services. Excellent rating and prices tell you all you need to know about out Scottsdale auto repair shop. Ensure quality service by choosing a licensed auto repair shop, such as Scottsdale Muffler.